A catheter stabilization device is a single-use device to secure catheter in position on the skin. It can be used in children and adults who need catheterization. A catheter is a long, flexible tube that is inserted in a vein or an artery through the skin. Catheter stabilization devices have gained popularity, as they offer stable securement for a catheter, unlike normal tapping or dressing. Rise in the incidence of urinary disorders among geriatric population is likely to drive the global catheter stabilization devices market in the near future. The global catheter stabilization devices market is characterized by increase in the incidence of chronic diseases across the world. The market is expanding at a rapid pace, due to implementation of government guidelines about catheter securement. The global catheter stabilization devices market is projected to expand at a rapid pace from 2018 to 2026. Increase in the geriatric population, which is prone to chronic diseases, large patient pool in developing countries requiring better health care facilities, and investments by public and private players in R&D on catheter stabilization devices to ensure elimination of catheter-associated infections and reduce the risk of catheter-related complications are key factors that are likely to drive the global catheter stabilization devices market during the forecast period. However, lengthy procedure of obtaining regulatory approval, significant investments required in the innovation of catheter stabilization devices, and lack of awareness about advantages of catheter securement during the catheterization procedure are likely to restrain the global market during the forecast period. Catheter stabilization devices are gaining popularity among health care professionals, as these have proved to be effective in reducing needlestick injuries and catheter-associated infections. Rising investments in the innovation in catheter stabilization devices and partnerships for co-development and commercialization of these devices are expected to fuel the global catheter stabilization devices market in the near future. In terms of product, the global catheter stabilization devices market has been classified into CVC stabilization devices, PICC stabilization devices, abdominal stabilization devices, chest drainage tube stabilization devices, and others. The CVC stabilization devices segment is projected to dominate the market during the forecast period. Expansion of the segment can be attributed to the increase in adoption of CVC stabilization devices for central venous catheter (CVC) securement, as it is an inexpensive option as compared to other types of catheter stabilization devices. CVC stabilization devices are highly preferred in academic institutes for practical teaching about securement of central venous catheters. Moreover, presence of key companies, such as Interrad Medical, Inc., engaged in R&D and manufacture of innovative catheter stabilization devices boosts the global market. Furthermore, initiatives by public and private organizations are aimed at spreading awareness about health-care associated infections among people. The relatively stable growth rate of the CVC stabilization devices segment can be ascribed to the ‘no reimbursement policy’ in developing countries and stringent regulations regarding manufacture and approval. The abdominal stabilization devices segment is anticipated to expand at an above-average growth rate during the forecast period, despite high use of these devices by end-users. This is due to implementation of stringent guidelines by government organizations to reduce prevalence of catheter-associated urinary tract infection (CAUTI). Abdominal stabilization devices are predominantly used in hospitals in case of patients suffering from urinary incontinence. End-users are increasingly preferring the use of abdominal stabilization devices, due to rise in awareness among patients. 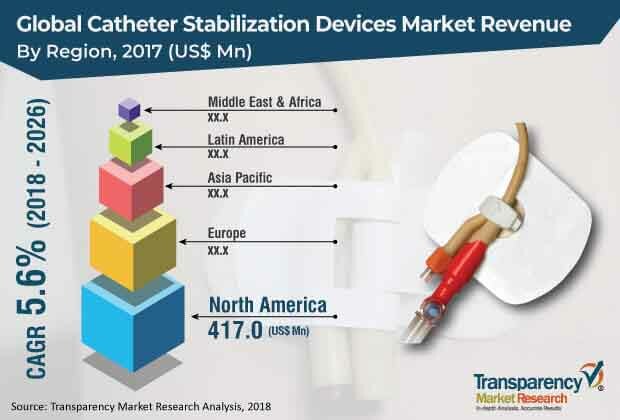 Based on end-user, the global catheter stabilization devices market has been classified into hospitals & ASCs, diagnostic centers & clinics, home care settings, and others. The hospitals & ASCs segment is expected to dominate the global catheter stabilization devices market during the forecast period. In terms of region, the global catheter stabilization devices market has been segmented into North America, Europe, Asia Pacific, Latin America, and Middle East & Africa. North America accounted for a major share of the global market in 2017. Europe was another significant market for catheter stabilization devices in 2017. Developed health care infrastructure, high rate of adoption of technologies, and relatively high paying capacity of patients in North America and Europe, compared to developing countries, offer growth opportunities to new market entrants. This results in high market share held by these regions. Considerable expansion of the medical industry in India and China and investments made by global companies in Asia Pacific for establishment of sales subsidiaries, in order to provide support and services to existing customers and attract new customers, are expected to propel the catheter stabilization devices market in Asia Pacific in the next few years.